Looking at the recent statistics for this site, I noticed the surge in interest on research topics for undergraduates. What they found were posts I made over the last few years that included lists of titles of researches being undertaken by our undergraduate students at UP Diliman Civil Engineering. In addition, there are also a lot of articles I posted about various topics on transport and traffic that could be used as basis for developing or identifying research topics for their undergraduate research work. There are a lot of problems or issues or challenges that the Philippines needs to solve. Thus, there should be a number of topics that students can choose from depending on their interest as well as perhaps the capacities or capabilities of their respective advisers to guide them in the implementation of their researches. Among the more “in demand” topics are those relating to road safety, public transport, traffic congestion, walking, cycling and even parking. Topics for undergraduate research should be something that could be implemented over a semester or two including the required review of literature, data collection (i.e., field surveys as well as secondary data collection from various sources) and the analysis of such data. Some topics can be more challenging than others and those requiring specific software (e.g., commercial rather than open-source) should not be encouraged if a school doesn’t have the resources. For the “techies,” topics involving development of software tools or apps may be encouraged as long as the objectives and data requirements are well defined and students don’t end up with useless products. The National Center for Transportation Studies (NCTS) receives a lot of inquiries every year from students of various universities about research topics on transportation. Most of these are emails and letters without the endorsement of their advisers or teachers. And so we advise them to get the necessary endorsements first before they could do their researches at the Center. This gives the request a bit of a formality though we can only usually extend limited assistance as the Center’s resources are also limited. We have to state, however, that we are not in the business of advising or guiding students from other universities or colleges. That is the responsibility of your faculty whose job is to guide your students. The Center can provide whatever it has in terms of data or information but the specific data or information should first be identified by the students and their advisers by doing research on the topics of interest. I have not yet posted on research topics for Academic Year 2014-2015 as UP has moved its academic calendar from June to August starting this year. At this time of year, we usually already have a list of topics for our students to choose from. These are topics that faculty have provided and which they could confidently guide students who would be under them (i.e., those who selected the topics they listed). It is highly likely that I would be selecting topics from some of the articles I have posted here and my co-faculty would be listing topics that address current issues or challenges in transport. Until perhaps the middle to last part of August when we would already know how many students will be assigned to our Transportation Engineering Group could we come up with a long list. By early September, our students would have selected their topics to embark on their undergraduate research work. We were looking for suitable sites for a traffic survey along Espana the other day and had chosen the pedestrian overpass across Ramon Magsaysay High School as a possible site for a camera to record traffic flow along the avenue. Data from the video will be used to calibrate measurements from other cameras that are part of an intelligent system under development and supported by the DOST-PCIEERD. Those cameras are currently installed at a post at the junctions with Lacson Ave. and Vicente Cruz St. The system will also utilise data from the ASTI’s flood sensors near Lacson and San Diego. What we saw on the footbridge was not exactly a shocker to us as we anticipated the conditions on the overpass. However, we all agreed that the conditions of such pedestrian facilities need to be improved significantly and in such cases as this footbridge, immediately! 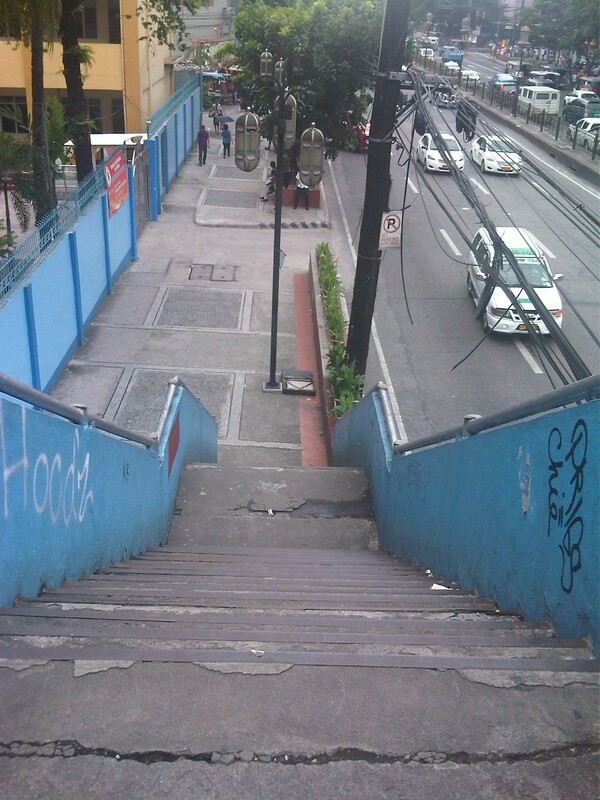 Walking to the overpass in front of Ramon Magsaysay with the school on the right. The overpass was partly flooded from the rains the past few days. The roofing only had the frame so anyone using the overpass on a rainy day would have to use their umbrellas for cover. 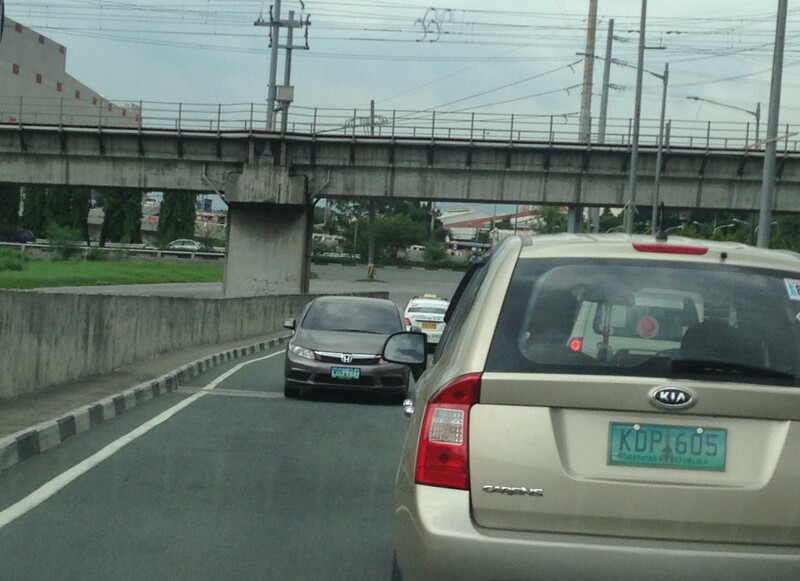 The MMDA had removed the roofs of many overpasses to discourage vendors and beggars to set up on the overpasses. Spared from the campaign were overpasses that were secured by establishments like those along Katipunan with Ateneo and along Espana with UST. While there are no vendors or beggars on this overpass, it’s quite obvious from the photo that vandals have been busy defacing the facility. Many open overpasses like this are stinky because they are (ab)used as urinals. Who knows about the composition of these puddles aside from the rainwater during this wet season. The overpass smelled of poop and that’s simply because there were poop scattered along the overpass. Neglected facilities like this, despite being used by many people (its right in front of a big public school) to cross busy streets like Espana, are often used by vagrants as toilets. Quick thinking and action by one of our staff reduced the stink when he got some soil from the (also neglected) plant boxes in the area to cover the feces that littered the overpass. NCTS staff setting up a camera while also taking up the conditions at the footbridge. The stairways to/from the footbridge are quite steep. Such features need to be designed with senior citizens, children and PWDs in mind. This overpass is located in Manila and is probably used by hundreds of students from the public school beside it aside from the other pedestrians that need to cross Espana Avenue. I think there is an opportunity here for the City of Manila and the specific barangay to improve the conditions of the facility and ultimately contribute to improving quality of life through the improvement of the quality of walking – the most basic of all modes of transport and certainly a strong indicator for a city’s health and vibrance. Jeepneys get a lot of flak these days for the poor services they provide including many cases of reckless driving that could cause (if not already have caused) road crashes. Many of these crashes do not involve serious injuries or fatalities. Often, these are sideswipes or rear-end collisions, the latter being the result of aggressive drivers not being able to brake in time partly as they like to tail-gate (tutok) other vehicles. The social side of a jeepney ride is often the subject of many tales that illustrate typical human behaviour. There are the body language involved in passing fares between passengers and the driver or conductor. There are the scents and smell of different passengers. There’s music and there’s talk among people riding the jeepney (e.g., friends or colleagues commuting together). There are even cases of PDA or public displays of affection, including among students who go home together. I think it is still common for males to show their affection by taking their partners home (to make sure they get home safely). One time during a ride home, I was fortunate to get a jeepney whose driver wasn’t reckless and whose conductor was a jolly fellow who engaged passengers in small talk while we were on our way to Antipolo from Katipunan. One passenger asked him how come it was more expensive to go to Antipolo Simbahan via Sumulong compared to the older route via Junction. He answered correctly that the former was a longer route (Google maps will tell you that the route via Sumulong Highway is 16.1 km while the one via Cainta Junction is 15.0 km.) but quickly added that the route via Junction usually took more time to travel along due to the congestion along Felix Avenue, Junction and Ortigas Extension. The other passengers agreed and joined the conversation, commenting on how many Antipolo-Sumulong jeepney drivers and conductors often try to choose passengers or attempt to cheat passengers on their fares (e.g., not giving back the right change or in some cases not even returning change). The good conductor offered his own observations in an accent that seemed to me as one for a native of Rizal. I wanted to join the candid discussion but decided to just listen in and be a spectator in this exchange. 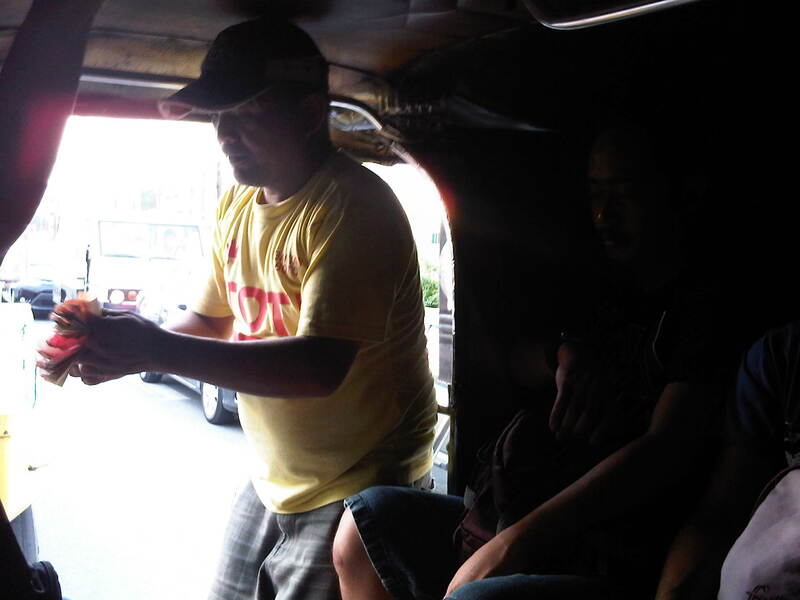 This jeepney conductor was honest and engaged passengers in conversation. The driver was not reckless unlike many others of jeepneys I have rode on. (He was at least middle-aged but nearing senior status based on his looks.) I thought this was quite rare given the many “patok” jeepneys operating these days and the younger drivers and conductors who don’t care about safety or passengers’ rights like senior citizens’ and students’ discounts. I think it wouldn’t have been like this where conductor and passengers were interacting the way they did if this were a “patok” jeepney. “Patok” or “popular” jeepneys often feature loud music (though many people will regard this as noise and no longer music) and passengers can hardly hear themselves talk. Often the loud music is an excuse for the driver or conductor not giving back the right change or any change at all to passengers despite the latter shouting at the driver/conductor. We were also lucky that our driver drove safer than your average driver. That meant a somewhat longer trip but I guess the interaction among passengers and conductor allowed for us not to notice the time. I guess these types of trips and interactions are what distinguished jeepneys from other transport. This is very much how commuting can be romanticised and is certainly something we will perhaps miss should the jeepney be phased out. Will it be phased out and is it necessary to remove jeepneys from our roads? I don’t think it will be phased out completely, and I believe that there is a need for the jeepney to be modernised but at the same time operate within a sustainable framework and hierarchy. And we need more of this conductor and his driver to be part of this system while purging out the reckless, abusive and disrespectful kind who make commuting unsafe and uncomfortable for many. Walking is our most basic mode of transport and yet it seems that we have failed to design facilities that would make us walk more conveniently and comfortably. Many Philippine cities have been developing their transport systems that favor road transport and motorized vehicles while generally neglecting the needs of pedestrians. Metro Manila cities have been quite inconsistent in the way they deal with the needs of pedestrians (i.e., walking) and often pass on the blame to the DPWH. While that agency also is definitely responsible with a lot of issues pertaining to suitable designs of transport infrastructure, I think LGUs should also be responsible and take up the challenges with respect to design of people friendly facilities. There are a lot more local roads than the national roads under the DPWH. And so LGUs, especially the more developed cities have a bigger role in developing their transport infrastructure to be more people oriented. Pedestrians can no longer cross at-grade at the intersection of Quezon Avenue and Araneta Avenue. Note the vendor in the photo (with umbrella) crossing counter-flow with his pedicab full of plastic merchandise. The cyclists in the photo are risking their lives and limbs in crossing the intersection. Fortunately for them, there seems to be no traffic enforcers around to apprehend them. The “yellow box” has been replaced by a “red box” in many intersections including this one. The pedestrian overpass at Quezon Ave.-Araneta Ave. as seen from the sidewalk along the Q.C.-bound side of Quezon Ave. The sidewalks are often obstructed by vendors but fortunately the overpass itself is not clogged by vendors unlike other overpasses. This overpass along EDSA is the outcome of pedestrian crossings being only an afterthought (some would say aftermath) of the EDSA MRT design. It is an example of the “pwede na yan” (this will do) attitude of many engineers and architects when it comes to transport systems. All of the above examples are found in Quezon City. That city is among the most wealthy cities in the country and there have been a lot of transport-related developments in the past few years that are more people oriented. These include the construction of sidewalks, overpasses and underpasses outside those typically under the MMDA. However, there are still a lot to build and may I say correct in order to promote walking and other non-motorized transport in the city. Quezon City and other cities can be walkable cities and walkability should not be limited to CBDs that are often (and again) passed on to the private sector for development. LGUs should not be too dependent on what the private sector can offer in terms of infrastructure for walking and cycling. There are not many responsible private companies out there who would commit resources towards walkable and cycling-friendly developments. Often they are tempted to maximize space for buildings, even sacrificing space for parking and motor vehicles, and ultimately at the expense of the general public. This is where LGUs, and not even national government, comes in to put things into order. However, the caveat here is that LGUs should have a plan to guide them in development and again, there are few LGUs that have this capability and capacity to plan and implement such plans. And here is where national agencies like the DOTC and the DPWH can provide help to LGUs given their resources and expertise. I have written recently about reckless drivers including one that drove as he was “busy” with his girlfriend in the car. The latter, however, is more an exceptional case rather than one you’d commonly find in our roads. Perhaps the most annoying behaviour by what I term as “nuts” on the road, is counter-flowing. Counter-flowing often happens along undivided roads (no median islands or barriers to split opposing traffic). Traveling home one afternoon, we took the bridge from C5 and the Marikina Riverbanks Road to Santolan, Pasig. I think we all thought that the driver of this Honda Civic was bold enough to have been able to cover a long distance before opposing traffic collectively forced the driver to back off. While counter-flowing is dangerous and obviously a traffic violation, there seems to be few if any apprehensions regarding this behaviour. Such non-enforcement of traffic rules and regulations lead to more drivers and riders to be encouraged to counter-flow just so they could get ahead of all the others before them who did follow traffic rules by queuing properly. For one, there are issues of police or enforcer visibility in many areas, and when they are visible they are usually busy managing traffic at intersections and or watching out for number coding violations rather than enforcing all the other traffic rules and regulations that can be more or equally important than number coding violations in terms of their impacts on traffic. One such violation is counter-flowing that often leads to severe traffic congestion as counter-flowing vehicle block opposing traffic and force their way in front of queued vehicles. I think this has caused a lot more problems, congestion and safety-wise than number coding violations, and deserve to get more attention from traffic enforcers and managers looking for solutions to the traffic mess we encounter everyday. I came across a few more online articles recently and this time one article featured mostly intelligent transport systems (ITS). ITS has been around for quite some time now and the big difference between now and a couple of decades ago is the cost for these systems. I would not delve into the details of ITS, and leave it up to the reader to perhaps google about this and all the different types of ITS. The article “Here’s How to Get Rid of Traffic Jams” presents the various systems that have been implemented in other countries. Some have been implemented one way or the other in some parts of the Philippines, particularly the coordination of traffic signals (Manila, Cebu, Davao) but most have not even been attempted so there’s a lot of room for the improvement especially where congestion is becoming more serious and unmanageable due in part to limitations among agencies and the people themselves who are involved in transport and traffic management. It also refers to a study on traffic congestion that was conducted for Los Angeles, CA. Reading through the document I couldn’t help but note that much of what LA has experienced and is still experiencing describes what we also try to deal with in Metro Manila and other major Philippine cities. Be sure to browse for the full document and not just the summary for the study. There are also a lot more materials on transport that you can find this website so be sure to bookmark Rand’s website.